About your personal information. We use the information you provide when shopping on our Site to process your orders, to keep you updated on your orders and to personalize your shopping experience. In order to most efficiently serve you, credit card transactions and order fulfillment. They receive the information needed to verify and authorize your credit card and to process your order. They are under contractual obligation to keep your personal information private and are not permitted to use or share your information for their own purposes including marketing. You will receive a confirm email after you had placed the order, It's all about your order information. When your item has been sent out, you will receive an email too. Please note: We never send you any spam email, and it's under contractual obligation to keep your personal information private and is not permitted to use or share your email address for their own purposes including marketing. 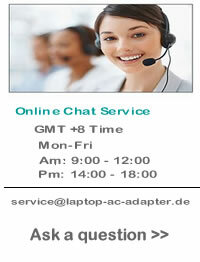 Unauthorised attempts to upload information or change information on the laptop-ac-adapter.de website are strictly prohibited and may be punishable by law. Tell-A-Friend. If you choose to use our referral service to tell a friend about our site, we will ask you for your friend's name and email address. We will automatically send your friend a one-time email inviting him or her to visit the site.